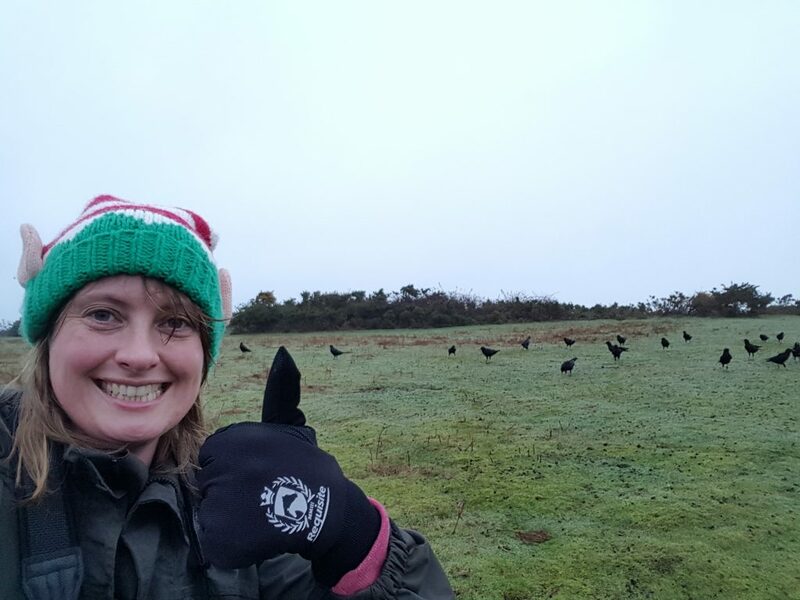 With thirty-five choughs now flying around Jersey at their leisure, the field team certainly clocked up the mileage in November trying to keep track of them. 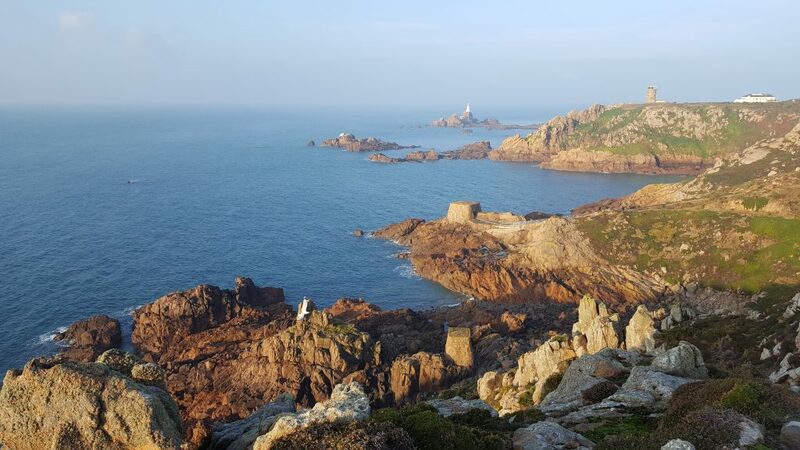 Aside from navigating the green lanes of Jersey, the team also had to deal with servicing the aviary in gale force storms, juveniles losing their radio-transmitters, and uninvited house guests. 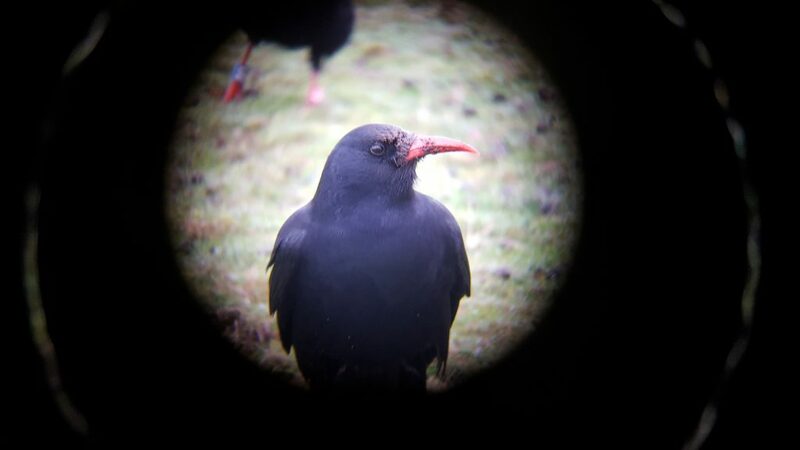 Monitoring the choughs in November divided the team in two directions. Photo by Liz Corry. 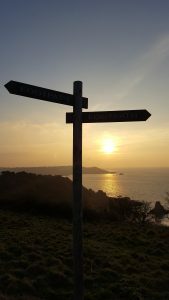 We continue to radio-track the 2016 release cohort to find out how far they disperse and which areas in Jersey they favour. The youngsters tend to stay together which makes it easy to follow them. Durrell’s parent-reared prodigy, Trevor, will occasionally favour hanging out with the sub-adult group which means he drops off our radar. He has been found with a group over at Les Landes from time to time. He may be going further afield. 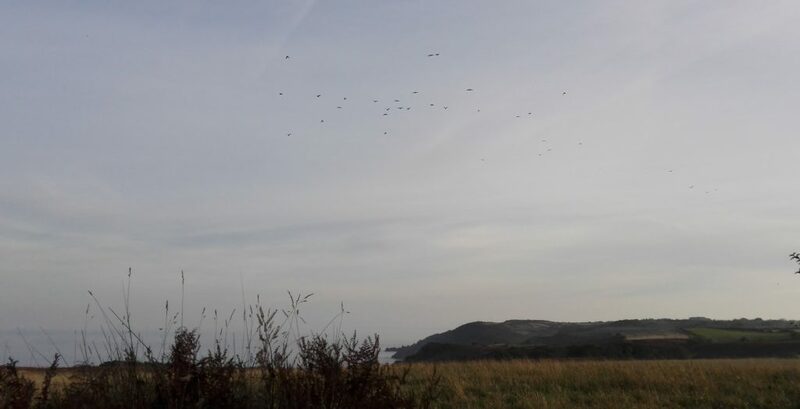 One of our Bird Keepers, Kathryn Smith, spotted a small group flying over Gorselands on her day off. 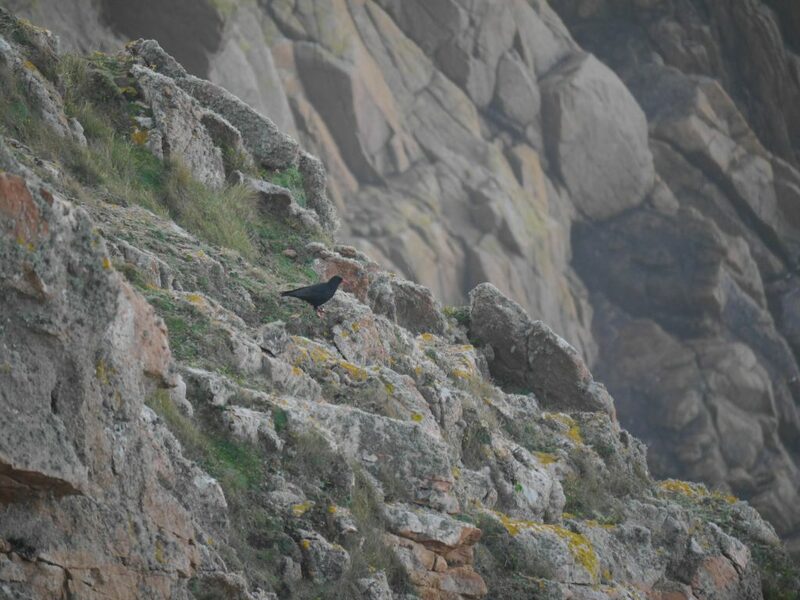 We know the sub-adults have flown over there in previous years and there was a report back in October of choughs at Beauport. 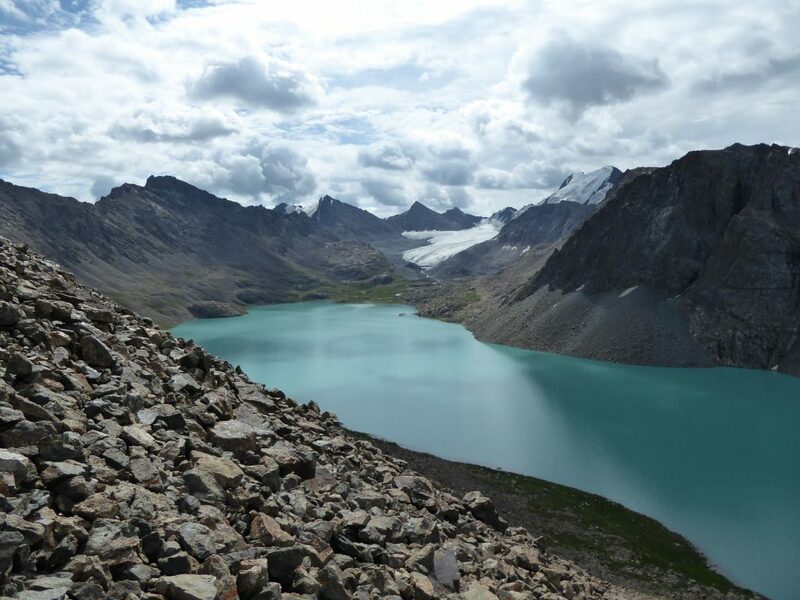 Kathryn’s sighting was somewhat unusual since it was later in the day at a time when the group normally stay put at Sorel. Could this be the start of something new? 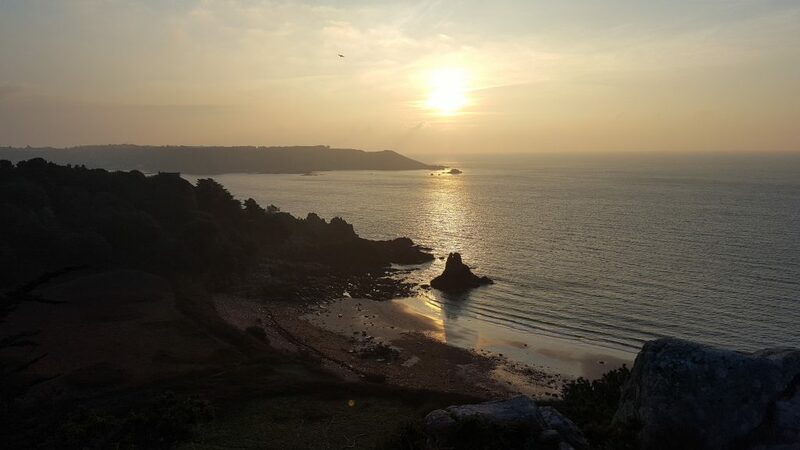 Sunrise search at Beauport. No choughs, but at least the view paid off. Photo by Liz Corry. 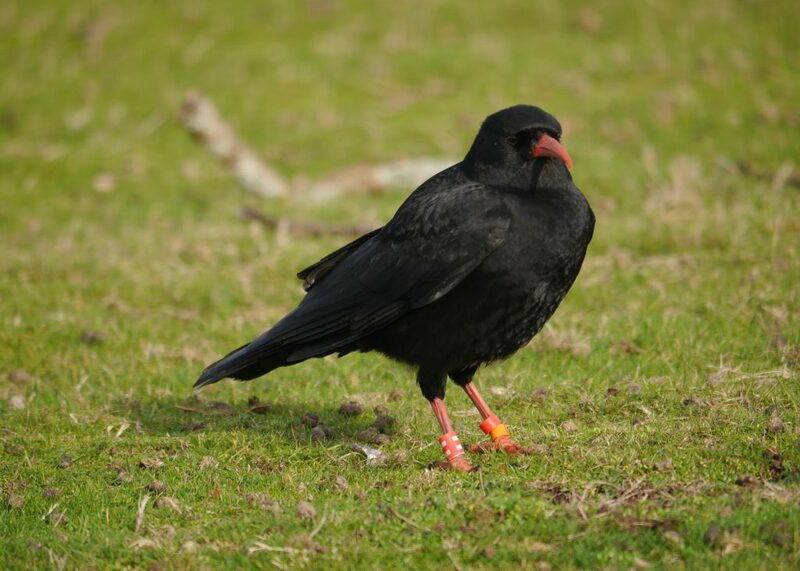 Reports of choughs on the south-west coast of Jersey this month kept the team on their toes. Photo by Liz Corry. We don’t know if Trevor has made it over to the south of the Island. Now we may never know, unless we can see his leg rings since he has lost his radio transmitter. 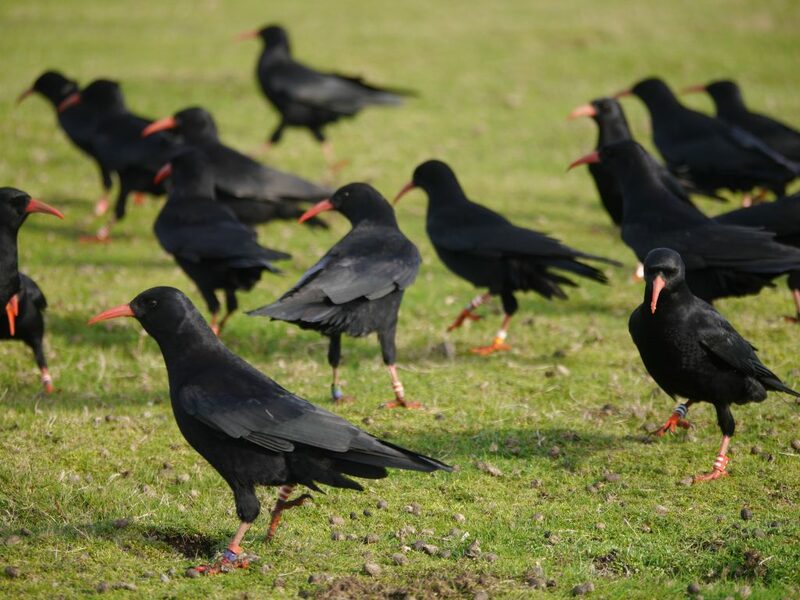 By the end of November, a total of four choughs had lost their transmitters out of the group of eleven; Trevor, Ubè, Duke, and Zennor. This is an unusually high number for us to lose within the first two months of use. In each case the middle tail feather, to which the transmitter is fitted, has become detached rather than the transmitter slipping its fastening. Trevor has lost his radio-transmitter and is now only identifiable by his red and orange leg rings. Photo by Liz Corry. We still have seven with transmitters and because they tend to stay in groups we have a fairly good record of where the other youngsters are. 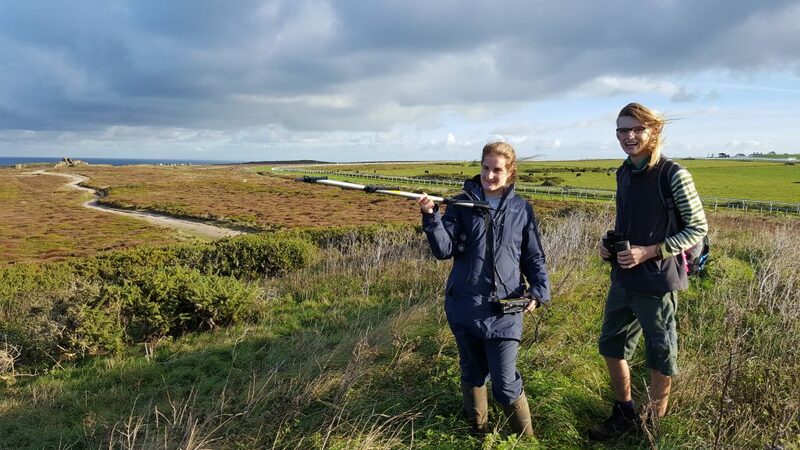 We get extra assistance with monitoring via the farmland bird transects carried out by volunteers across the island. 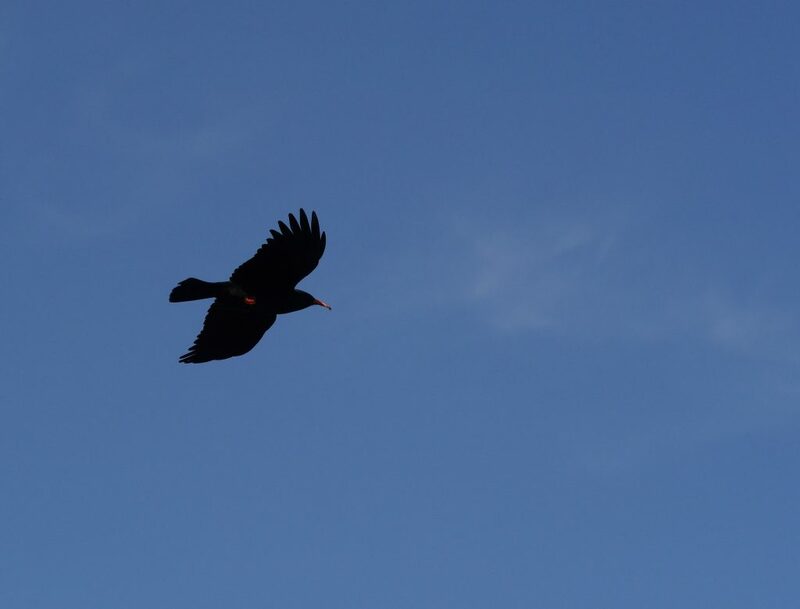 The choughs have now been recorded on the transects at Crabbé, Les Landes, Les Creux, and of course Sorel. 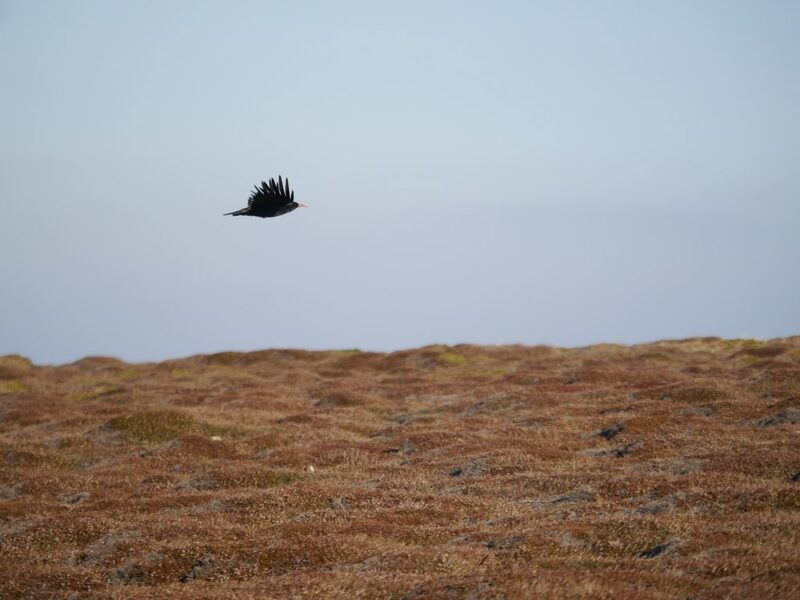 Choughs flying over the Crabbé transect. Photo by Maddie Rusman. Lee and Caûvette have been inseparable over the past year. Lee was imported from Paradise Park in 2015 and released a month later. At that point Caûvette, one of our hand-reared females, had already been flying around Jersey for a year. She played it cool, eventually falling for his charm and now they go everywhere together. Next year, at the ages of two and three-years-old, they should begin to show an interest in breeding. They may well have already started planning ahead. Their absence at the morning feed was noted several times this month and has now become the norm. They always show up for the afternoon feed and stay around to roost out at Sorel. By sunrise they are gone (unless its horrible weather and then they can’t be bothered to travel anywhere and who can blame them). 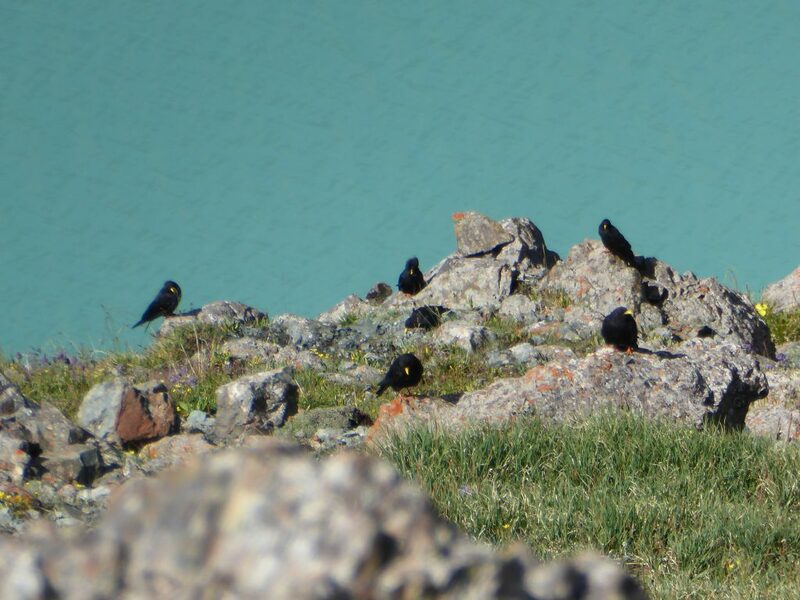 Radio-tracking choughs (?) at Les Landes. Photo by Bea Detnon. 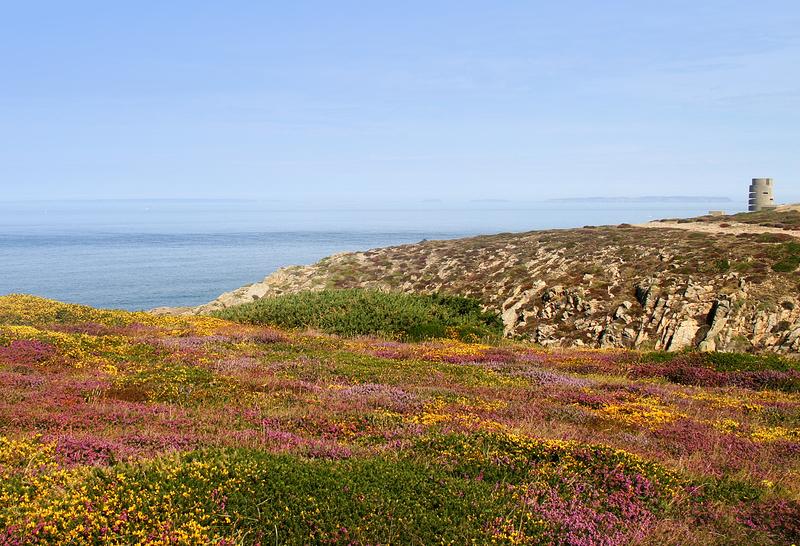 They spend their mornings at Les Landes either pilfering the race course or gleaning the cliffs for insects. In between feeding they like to hang out on one of the many concrete structures dotted along the cliff tops, remnants of the German occupation during World War II. 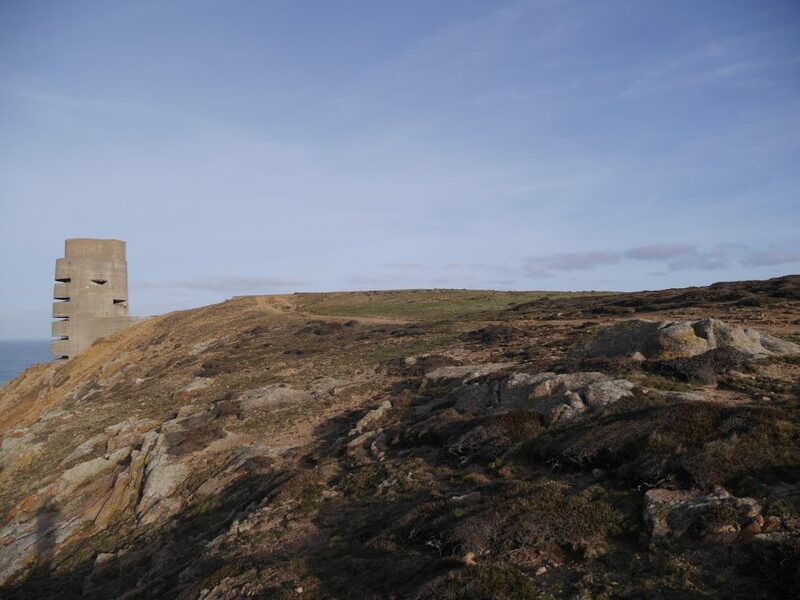 Gun turrets, bunkers, and look-out towers to name a few. 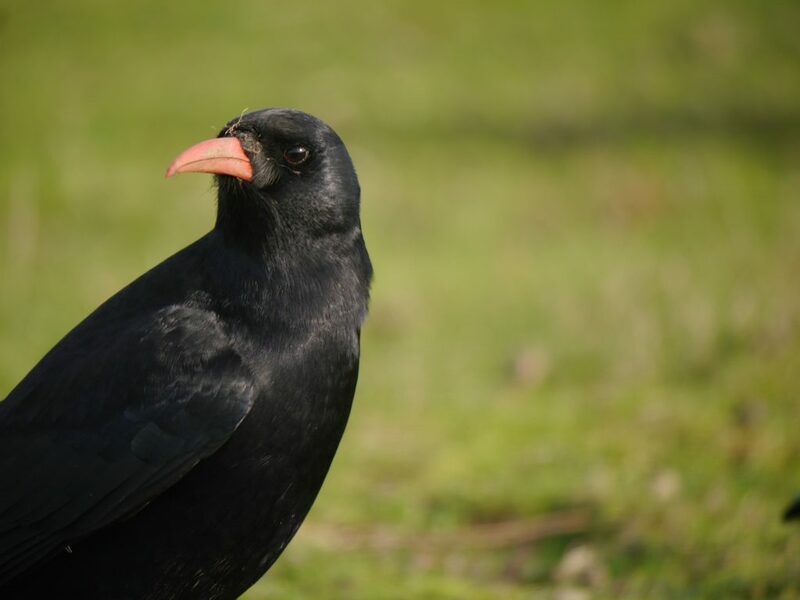 Hated by some Jersey residents, loved by the choughs. 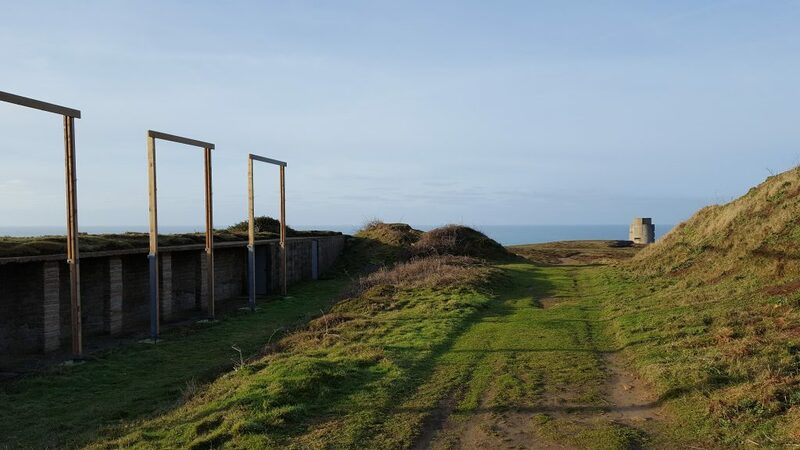 WW2 German observation tower sits on the cliff top at Les Landes constructed during the occupation. Photo by Liz Corry. The rest of the flock visit the area, but not as regularly and there always seems to be a slight division between the pair and the others whilst feeding. As an unsuspecting springer spaniel out for a walk can attest for. Lee, closely followed by Caûvette, appeared out of nowhere, flew towards the dog, and landed within two metres shouting at the confused animal. 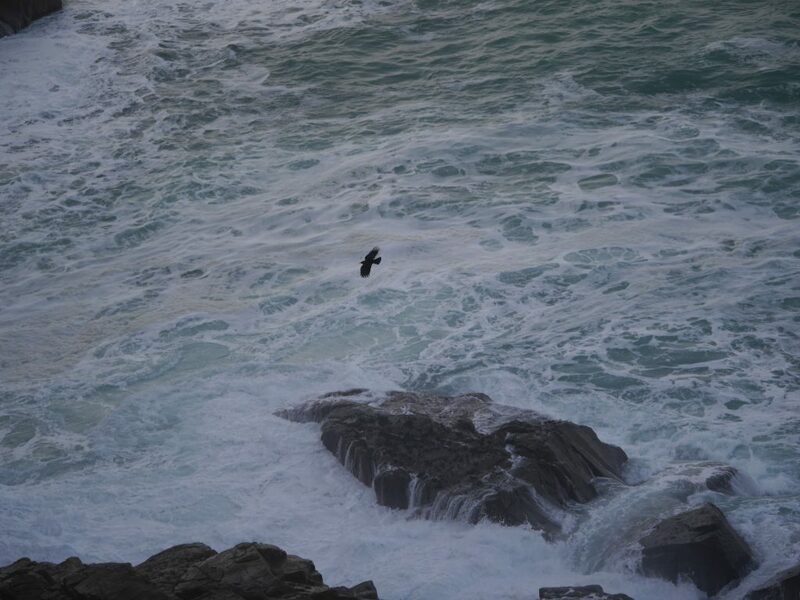 Suddenly six other choughs flew up from the cliffs behind and it became clear that Lee’s disapproval was not at the dog’s presence, but the other choughs in his patch. It will be interesting to see if the pair continue to visit Les Landes throughout winter. 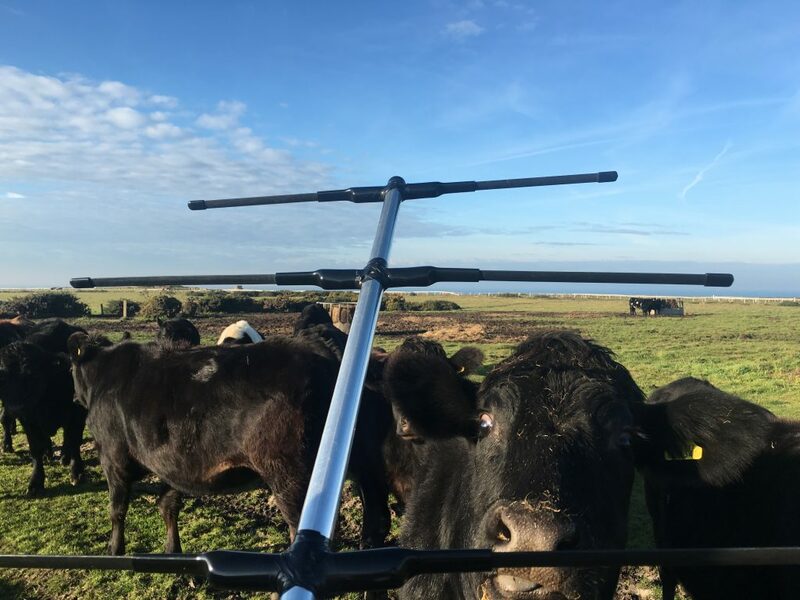 We would like to attach a radio-transmitter to Lee prior to the breeding season to get a clearer idea of what they get up to. However, that means we need him to return to the aviary for the morning feed so we can catch him. Leaving it until the afternoon feed is not practical whilst roosting time is so close together. That certainly isn’t happening anytime soon. Lee has taken a liking to the headland at Les Landes. Photo by Liz Corry. The release aviary suffered minor damage in Storm Angus. Photo by Liz Corry. The aviary took a battering from Storm Angus towards the end of November. Fortunately most of the damage was cosmetic. A side panel blew off and the signposts cracked under pressure. The timber support running down the middle of the poly-tunnel snapped and needs replacing. A couple of the hinges on the hatches have been bent out of shape which means we cannot close them. 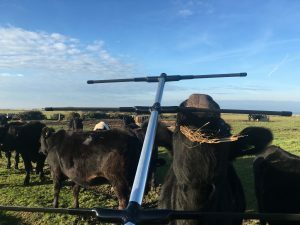 We discovered this the hard way when we tried to catch up one of the birds to fit a radio-transmitter. The framework on the poly-tunnel has a noticeable lean to it now as well. Although after surviving three winters I’m not sure all the blame can be put on Angus. 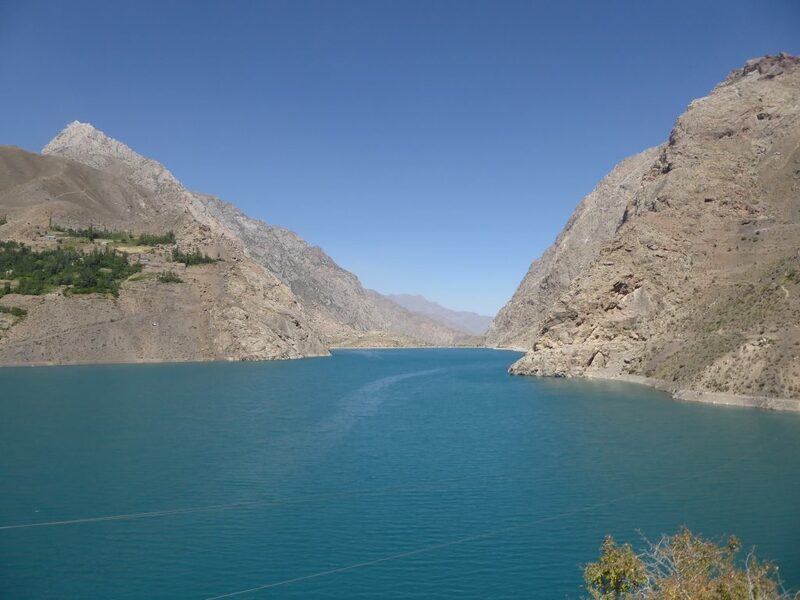 Hopefully, we can address these issues before there is any serious damage. 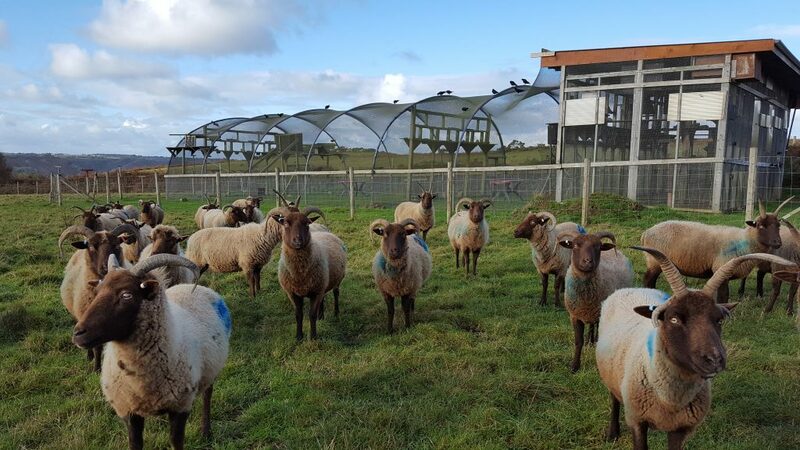 Friends with benefits – a small flock of sheep has been moved into the aviary field. Photo by Liz Corry. 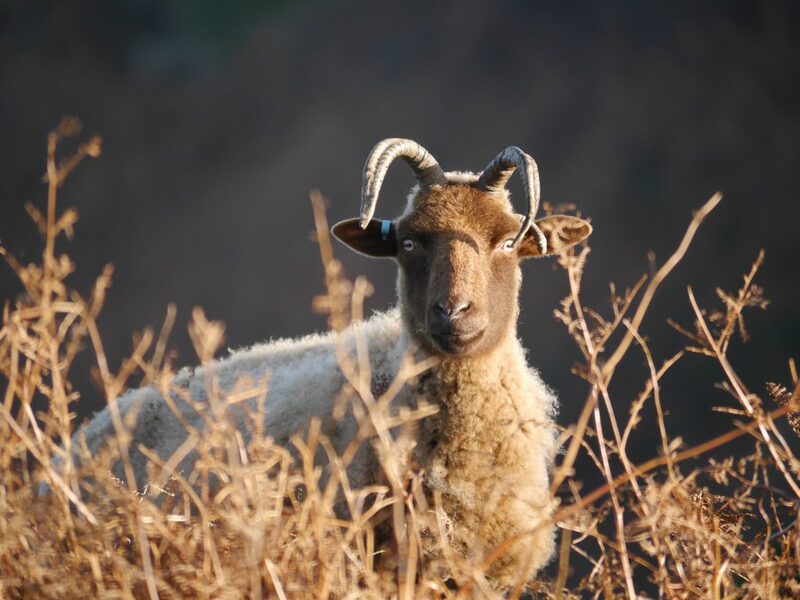 Whilst we complain about the onset of winter, the shepherd out at Sorel has already turned his thoughts to spring and preparations for next year’s lambing season. 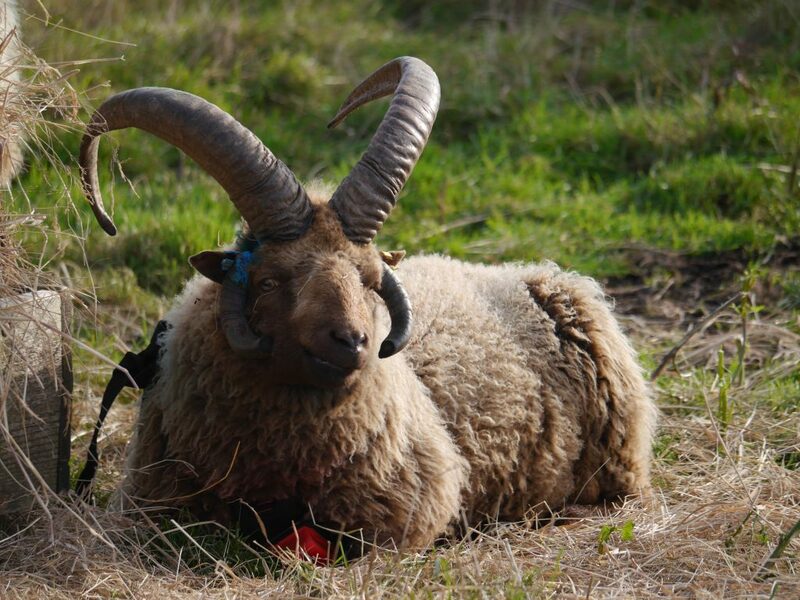 A select group of ewes were moved off the cliff tops into the aviary field to join one very excited ram. A ram and his ewes moved into the aviary field this month Photo by Liz Corry. They are provided with lots of extra food whilst confined to the field. 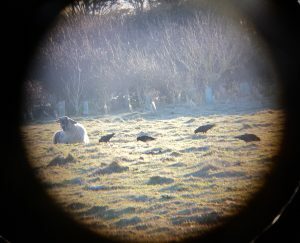 To our surprise the choughs have taken a liking to some of the sheep’s food. A bit cheeky since they have their own. 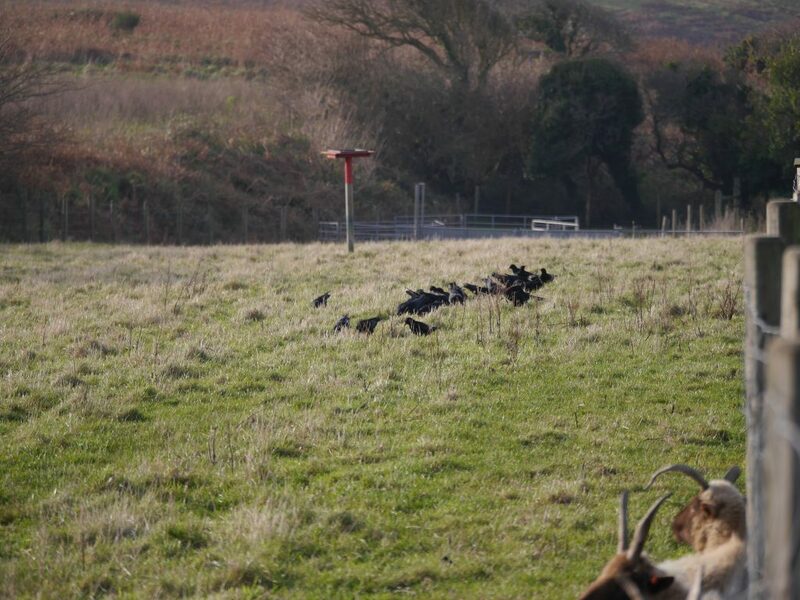 The choughs stealing food put out for the sheep. Photo by Liz Corry. 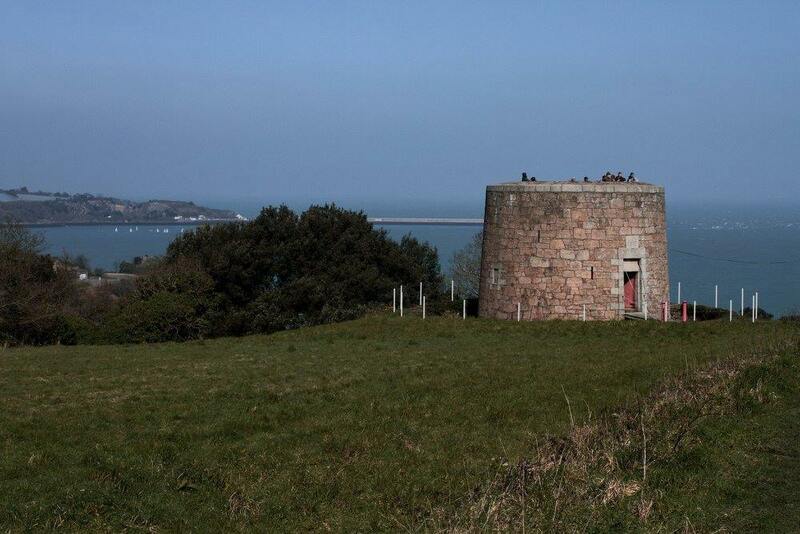 Over the years the release aviary has been of interest to a number of species other than the choughs. 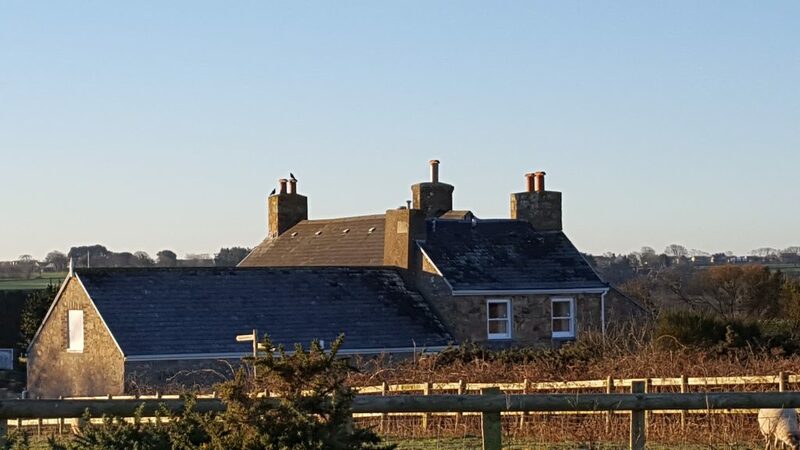 As soon as the aviary was built, the local kestrels started perching on the roof to scope out the fields and hedgerows. Stonechats, robins, and magpies have all benefited from the supplemental feed. Magpies being the only bird species to venture inside the aviary with the choughs to dine. 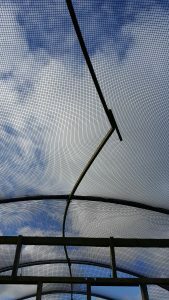 The aviary structure itself and spillage from supplemental feed makes it attractive to rodents, typically mice and shrews. Feral ferrets have also shown an interest, luckily from the outside only. Over the past three years we have found the odd owl pellet now and then on the shelving outside the aviary. Last month we started getting pellets on a daily basis INSIDE the aviary! Now we know why. It took a week of recording before we got a glimpse of a barn owl. A few days later this video showing a second owl stunned us all. Two barn owls have been using the aviary to hunt and eat. The owls only visit at night. The choughs don’t appear to mind sharing. Probably because they are asleep at the time. We have at least a dozen birds who choose to roost in the aviary and they haven’t changed their behaviour with the presence of the owls. At the start of November we welcomed Paradise Park keeper Logan Ody to the island. Logan spent the first week attending the Avian Egg Incubation workshop held at the Durrell Training Academy and run by staff from Los Angeles Zoo and Durrell. This workshop is designed to equip the participant with the necessary skills to artificially incubate a wide range of avian species increasing captive breeding success. 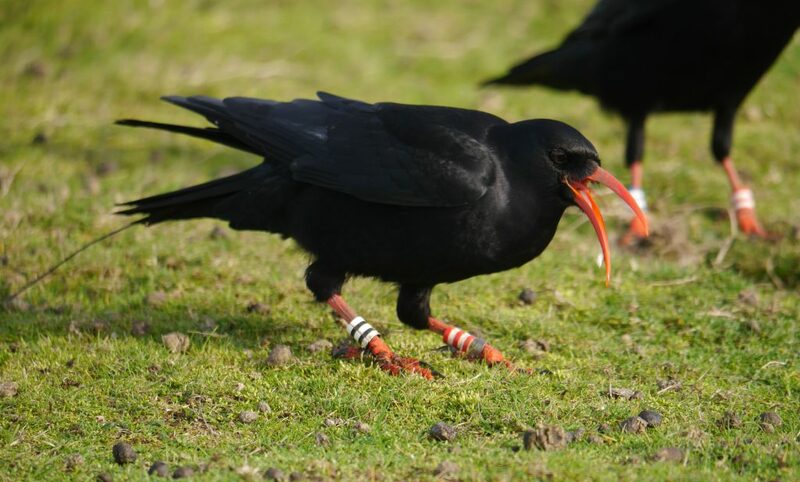 Skills which have been put into full use on the chough project over the past four years. 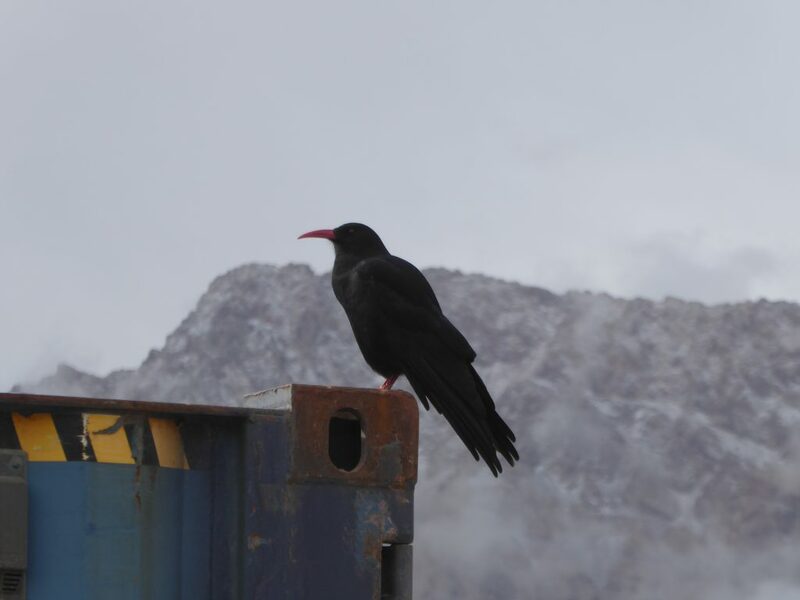 When the five day workshop finished, Logan joined the Bird Department to see behind the scenes then headed out to Sorel to spend his last two days with the choughs. 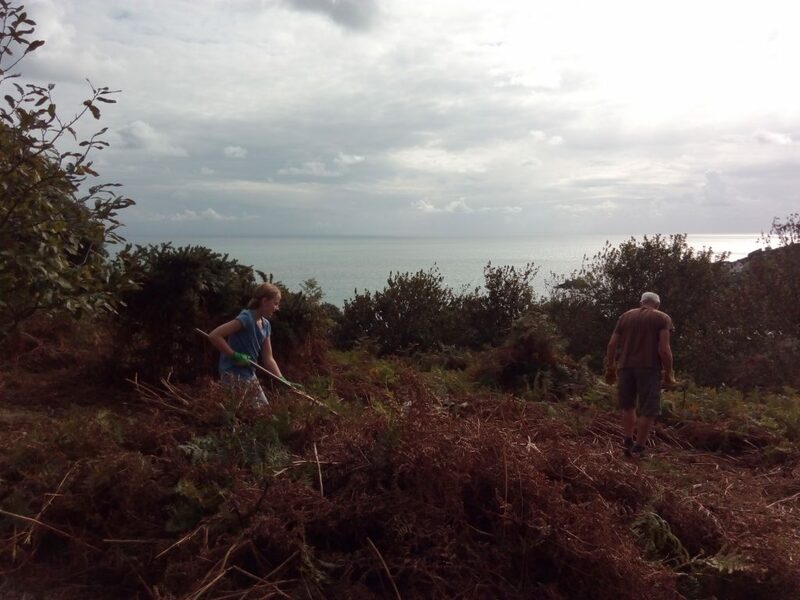 Some of which Logan helped rear back at Paradise Park and could now see flying around Jersey. His enthusiasm for the project had a huge impact on staff. His penchant for wearing shorts on a cliff top in a blustery November was less contagious. Maybe its a Cornish thing?